It was an incredible Monday in the city of Brisbane in Queensland, Australia. As the warm summer day cooled off at dusk, skyscrapers’ lights glowed in the distance and danced across the river nearby. But inside the Riverstage venue they was also plenty dancing. Both literally and figuratively. 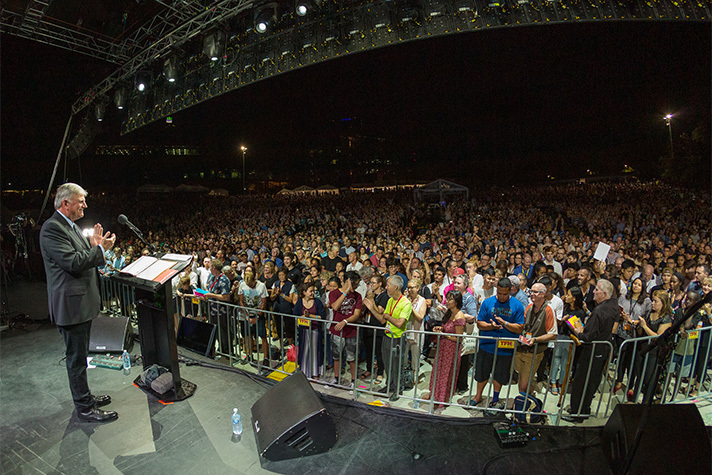 More than 8,700 people poured into the Riverstage venue, ready for an evening of worship including music artists Steve Grace, the Planetshakers and David Crowder, and preaching from Franklin Graham at the only outdoor event space of the six-city Graham Tour. On a hill, some of the audience sat on blankets or cushions facing the stage framed by palm trees, while others took a seat in a plastic chair or stood. A cluster of people danced in the front, jumping up and down and raising their hands and voices in praise as music played. And later, the crowd danced for joy as hundreds made decisions to follow Jesus Christ while hundreds more indicated decisions from watching online in 82 countries. As the venue reached capacity, more than 100 people headed to the city’s botanic gardens to watch the livestream as it blasted the Good News across the park. 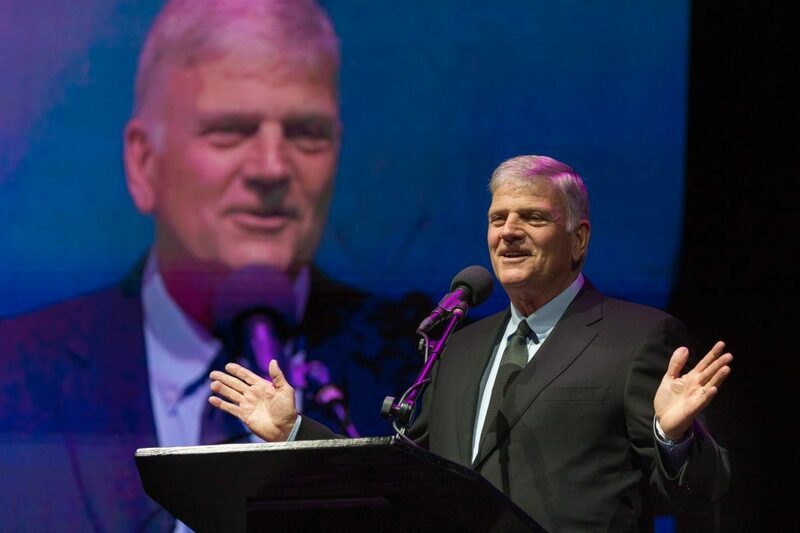 On Monday, Franklin Graham made his fourth stop on the Graham Tour in Brisbane of Queensland, Australia. With an audience of more than 8,700, the event space reached its capacity and over 100 people watched the livestream from a nearby botanical garden. And at the edge of the crowded event, Tony Zimmermann stood alone, his hands steadily grasping a walker. “I went to Billy Graham’s [Crusade] in 1959. I walked down to the front,” he remembered. And 60 years later, eyes glued on the stage, he found himself in a similar place—as once again the hope of Christ was shared. Cradling her 4-year-old daughter, Sarah Gierke knew that to be true. “It’s by the grace of God she’s here,” Sarah said as she gazed at her sleeping daughter, Hollie. 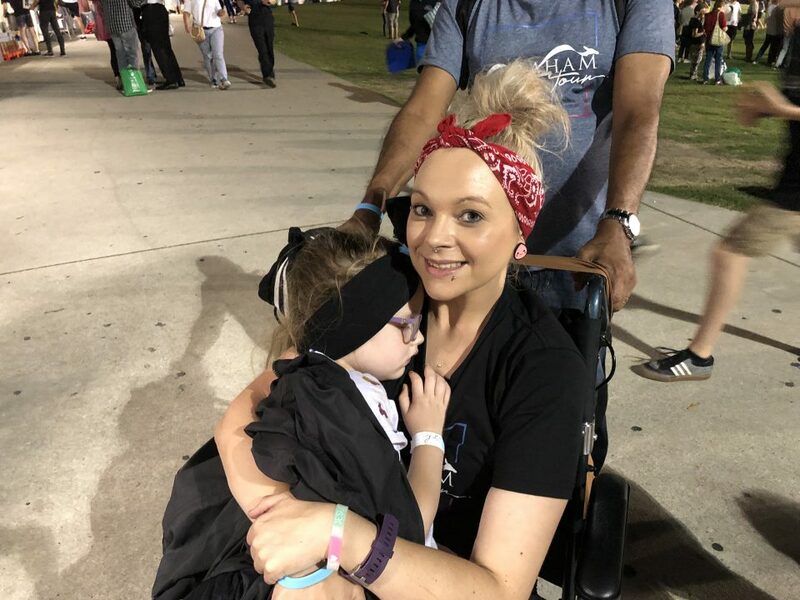 It was Sarah’s first time returning to Brisbane since Hollie was airlifted to a hospital in the area due to a medical emergency two years ago. Sarah nearly lost her. After her daughter had seizures and turned blue on Australia Day (Jan. 26) in 2017, the 32-year-old recalls dropping to her knees and screaming out to God to save her daughter. Since then, Sarah has faced a personal battle with lupus disease, but that hasn’t stopped her faith. Sarah Gierke has faced much over the past few years as a single mom and battling disease. Yet, she still chooses to find joy in Christ. On Monday, she danced with her daughter in the crowd’s overflow space while the livestream played in Brisbane’s botanical gardens. That was reiterated by Franklin on Monday, giving her goosebumps. Moments later, Franklin asked those who wanted to make a decision for Christ to come forward. Sitting in the back of the venue with Hollie on her lap, Sarah couldn’t see what was happening. More than 300 people were responding to this message of hope, walking down front to make a life-changing decision. Friends Twyla and Priscilla weren’t personally invited to Monday night’s Graham Tour event in Brisbane. They don’t belong to a local church. But they saw an ad pop up on social media for this event with Franklin Graham at Riverstage. Crowder and Planetshakers were going to be there. The two college students thought, why not? The two were convicted by the Gospel message shared by Franklin Graham and came forward to give their lives to Christ. 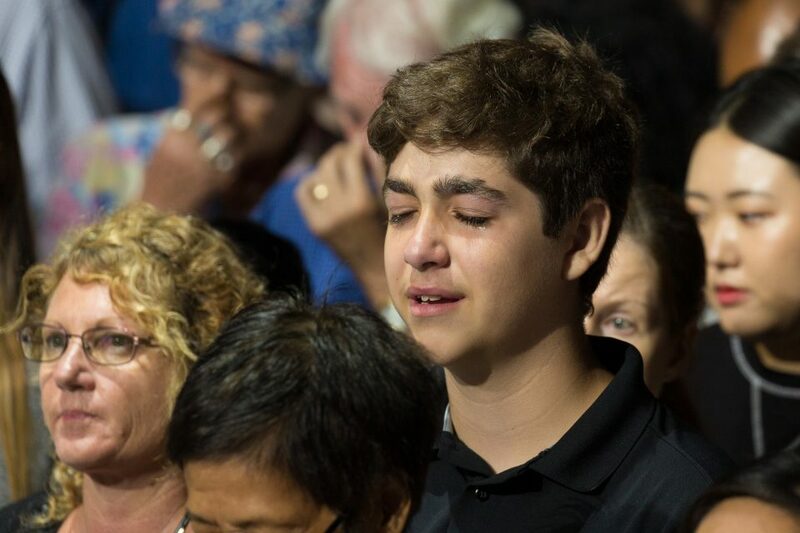 It was an emotional evening for many as they heard of God’s great love for them. The impact of the Graham Tour will certainly be felt in all the new believers professing faith in six cities around Australia. But like the 1959 and 1969 Billy Graham Crusades in Australia, some of the greatest lasting impact on the local church was felt in the pre-event Christian Life and Witness Course (CLWC), which helps Christians practically share their faith with others. Across the country, more than 12,000 completed the CLWC class with 6,000 becoming prayer volunteers to help minister at the Graham Tour invitation. She remembers her parents talking about the impact the 1959 Crusade had on their lives as young adults. So when she heard about the Graham Tour coming back through town, getting involved was a no-brainer. She was so excited, she brought a friend along, too. “I don’t think you can hear that too often,” Taylor said about being a witness for Christ. 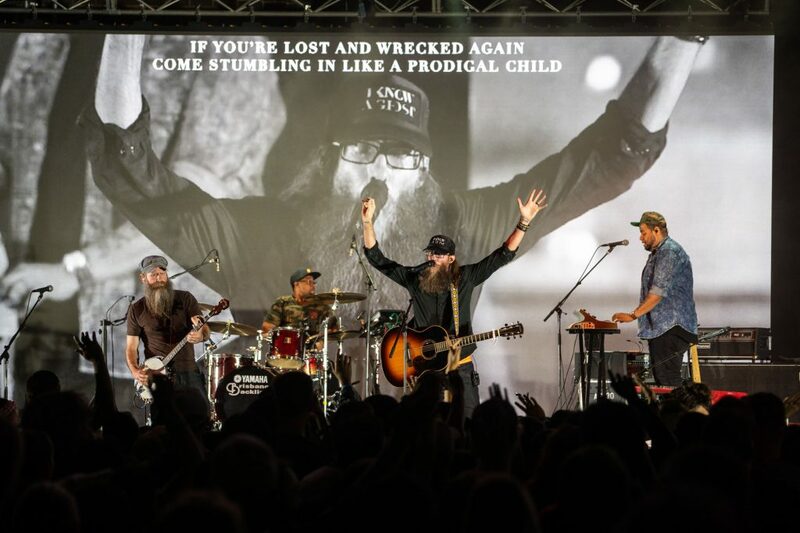 David Crowder was the last musician to take the stage and closed the evening with praise to a mighty God. Searching for something more than the temporary things of this world? Start a relationship with Christ today.